Are you the person who likes to solve crimes? Do you enjoy watching NCIS or read mystery books? Turn this passion into a career. Forensics is about investigating, identifying clues and solving crimes. What is Forensics all About? Forensics courses are built to equip students with skills and expert knowledge in investigating crime scenes. These courses help you to engage with victims, collect evidence and understand the criminal procedure. Find out which one of our forensics course will suit you best. Do you enjoy investigating situations or solving mysteries? 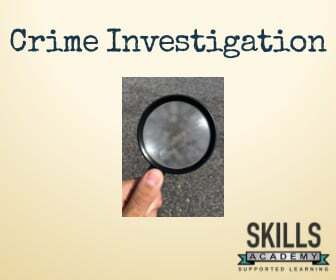 You should consider doing a course in crime and investigation. Where can you Work With these Courses? Are you keen on working with fingerprints and DNA? Then one of our forensic science programmes would suits you better. These programmes support the crime and investigation courses. Have a look at the following courses that we offer. What Will you be Gaining out of These Programmes? Form part of the team that collects, analyse, interpret and present the evidence. Part of your job is to explain the evidence to people who do not have a scientific background. If you want to upgrade your course, you can do so to receive related Unit Standard Credits on the National Qualifications Framework (NQF). These credits can add up to a fully accredited qualification for the Forensic Science programmes. For the Forensic Investigation programmes, you can earn accredited Unit Standard Credits. 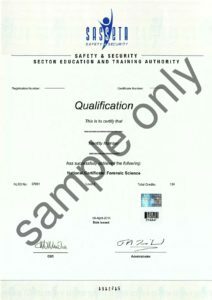 The Unit Standard Credits in the Forensic Investigations programmes, do NOT add up to a full qualification. You can use the skills that you’ve gained through these courses to improve your CV. Who Would Benefit From Studying Forensics Courses Through Distance Learning? People who want to change their careers to crime investigation, but need to study and work at the same time. It is also for the people who have an interest in the subject and would like to gain more knowledge. Maybe you are currently in the field but want to improve your skills, then distance learning would suit you. 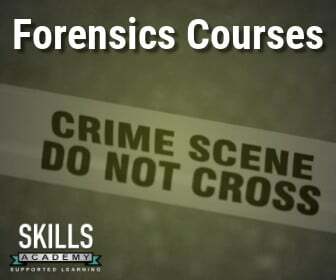 Where do you Sign-up for one of our Forensics Courses? You can start right now by calling us on our 0800 39 00 27, and a course expert will contact you.